Take a self-guided walking tour through a forest of giant majestic Redwoods turned to stone by a local volcano 3.4 million years ago! Take a naturalist led tour or take one on your own as a self-guided tour. 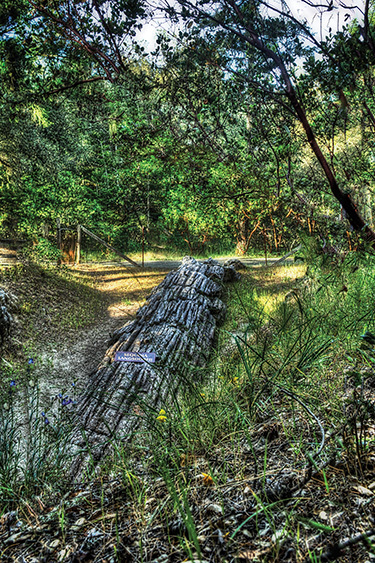 Main Trail: Petrified Redwoods, ½ mile, rated moderate. Enjoy a stroll through their beautiful forest trail where you will be able to observe the awesome spectacle of massive fallen fossil trees and the incredible detail of preservation they present. The trees were turned to stone due to an explosive local eruption in the vicinity of Mt. St. Helena. Meadow Trail: View of Mt. St. Helena, Volcanic ash fall, ½ mile rated moderate. Go a little further and you will be rewarded with a view of the remains of the ancient volcano that buried these now fossilized redwoods 3.4 million years ago. After taking a break to enjoy the view of the mountain through a beautiful meadow, have a walk around the corner and you will discover the striking view of the ash fall that contains diverse deposits of volcanic debris such as tuff, rhyolite, iron concretions, obsidian, as well as the ubiquitous petrified wood shards. Redwood Trail: Hike through a living redwood grove, 1 mile, rated moderately difficult. Their new trail provides a lovely walk that winds through a forest of pacific madrone, tan oaks, Douglas fir, and the beautiful groves of redwood trees providing an immediate comparison between the living and the petrified. They open this trail for guided walks every weekend at 11:15. See www.petrifiedforest.org for updated and additional information. Located between Santa Rosa and Calistoga.